Question: “Calorie-dense carbohydrate?? ?” What's that? (even me!) wants to discover is true . . . But I'm afraid that it is. Answer: That doesn't work, at all. Perhaps you've tried that in the past? I explain, below, why it must be total avoidance or don't bother. These Low-Carb Research web pages were created as companion resources to the series of podcasts Leo Laporte & I produced during 2012. High quality video, audio, and textual transcripts of these podcasts are freely available at the link above.
! ! ! IMPORTANT HEALTH NOTICE ! ! ! These podcasts and web pages describe and explore the characteristics and use of a profoundly significant alternative in human dietary metabolism known as “ketosis”. We would NEVER suggest or propose any behavior that we believed to be unsafe, and many thousands of modern humans have tread this path before us without trouble — not to mention countless millions of pre-agriculture paleolithic humans throughout several million years of evolution. But every individual's body is unique and it will respond in its own way to switching away from a lifelong, traditional, carbohydrate-rich sugar-based diet. You are therefore urged in the strongest possible terms to ONLY embark upon any major changes in your diet under the supervision and guidance of your knowledgeable physician. Although your personal physician may not be educated in the use of dietary nutritional ketosis, he or she can still provide valuable supervision and laboratory tests to assure that your body and organs are adapting, without harm, to the many changes that will occur. These GRC web pages do not replace the wealth of fabulous information from the many authorities who have studied low-carbohydrate living. Only the best books and sites are listed here. PLEASE consider examining these carefully selected resources. carbohydrate... which we call wheat, rice, corn, potato, etc. Man's invention of agriculture changed us forever. Rather than nomadically roaming home territories in search of sufficient food sources, we were, for the first time ever, able to “put down roots” (pardon the pun) to create fixed-location resources. We could dig wells, build villages, create tools, and begin skills specialization. Since a few people (farmers) could create ample food for many, that labor was freed for other productive and supportive purposes. Agriculture was a HUGELY successful invention. But what is it really? Viewed at its fundamental level, agriculture is a technology for reliably generating vast amounts of human consumable calories in a small space under controlled conditions. Agriculture is about generating as many calories as possible to feed as many people as possible. And today, as we know, modern highly-advanced agriculture truly feeds the world. So many calories of food are grown today that the world's population could not possibly be fed without agriculture's incredible output of human-consumable calories. Agriculture was invented independently around the world approximately 6,000 years ago. So for the past many thousands of years agriculture's production of ever growing quantities of wheat, corn, rice, potato, and every other vegetable was seen as purely positive. Until very recently everyone believed that calories were calories were calories, and the notion that there could be “good for us calories” and “bad for us calories” was considered absolute nonsense. But the belief that all calories are the same has been called into question as the increasing incidences of cancer, heart disease, and acquired diabetes are reaching epidemic proportions in a society that is increasingly following the “healthy” guidelines to reduce fat intake, reduce meat consumption, and eat more fat-free carbohydrate grain and starch. 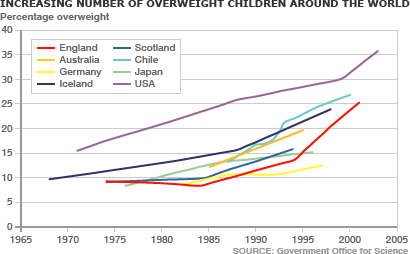 Some argue that it's not that we're getting sicker, it's that we're living longer—but children are becoming overweight, obese, and diabetic. Recent carefully controlled studies are showing significant association between high grain and starch consumption and long-term troublesome health outcomes. The problem is that “association” is weak evidence at best, and we humans are notoriously bad at detecting anything that hurts us only a bit and kills us slowly. Just look at all the push-back smoking received as the evidence mounted that it was causing a range of problems. “Big Tobacco” business interests didn't want it to be true, and neither did the millions of people who loved smoking. Even though there was a lot of support for denying it, it was true nonetheless. And it took a long time for everyone to admit it. It looks like we have exactly the same situation here with high-starch, low-cellulose carbohydrate food. Our bodies have two storage forms of fuel—glycogen & fat—and three working forms of fuel—glucose, free fatty acids & ketones. Glucose (sugar) enables our bodies to respond to emergencies. It can be instantly called upon and burned (metabolized) without oxygen (anaerobically) to allow us to outrun predators and respond instantly. As a result, our bodies do not need large sugar storage and cannot store more about two thousand calories (kcal) of glucose in the form of glycogen. Note that this is about one day's worth of calories. Our body's primary non-emergency “working energy” system is fat. Fat contains more than twice the number of calories per gram as glucose (9 versus 4) so it's very efficient. Saturated fat stores for long periods without spoiling (oxidizing). So typical males carrying 20% body fat have more than 150,000 calories of readily available energy with them at all times. Women, who typically have closer to 25% body fat stores carry even more calories. This is 75 DAYS of available calorie reserve! So you can see that it makes sense that fat, rather than glucose, would be our primary operating fuel. our bodies to function most efficiently. Before the invention of agriculture, our bodies had no access to high-starch low-cellulose foods, so our metabolisms naturally operated in a fat-based mode... because there WAS NO SUGAR. 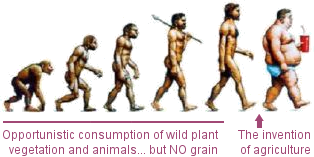 After the invention of agriculture, with its super-efficient and inexpensive mass-production of high-starch low-cellulose food stuffs—wheat, corn, rice, potato—our bodies no longer needed to operate their efficient and lean fat-based metabolism, since they were being fed RAW SUGAR three times a day! reprograms our bodies to burn sugar. Sugar? But wheat, corn, rice & potato aren't sugar! Actually, they are . . . Grain and starchy vegetables have very little nutritional value beyond the energy of their calories. This is why breakfast cereals need to be “fortified”: It's because of what you're not getting when you're eating cereal's empty calories. That bread holding your sandwich meat, that pile of rice on your plate, and those potatoes to go with your meat, are all nothing but simple sugar to your body. bad for us... especially when we like them! Not everyone is equally effected by the long-term health-corrosive effects of sugar in the form of wheat, corn, rice, potato, etc. And very few people are negatively affected very quickly. But many people have long-term trouble that creeps up on them slowly. So slowly, in fact, that they never know what it is that's damaging their health. Especially when everyone else around them is eating the same thing, and when our goverments, federal agencies (FDA & USDA) and doctors are all telling us to cut back on the fatty foods and eat more “heart-healthy” zero-fat carbohydrates. Just look around you at the result of a nation's people all attempting to follow this logical advice. 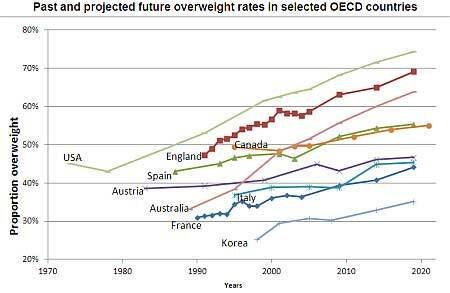 A huge and rapidly growing percentage of people are now overweight, many are either diabetic or pre-diabetic, others have heart disease. And the medical establishment wants to put everyone on statin drugs. It's a mess. What happened? Agriculture happened. High-fructose corn syrup made from all the corn we're now growing happened. Encouraging everyone away from fat and toward eating sugar—in the form of high-starch low-cellulose grain and vegetables—happened. It always made sense. On its surface it still does . . . but it's still wrong. Thousands of people, now including me, have begun experimenting with seeing what happens if we flatly reject the standard high-carb “wisdom”, that no longer seems so wise. It isn't at all easy to “go against the grain” (pardon the pun) in a society where wheat, corn, rice and potato are truly everywhere, hugely popular, socially accepted, and part of nearly every meal. But truly amazing and unexpected things happen once you have retrained your body and switched it back over to the fat-burning, fat-metabolizing mode that all the evidence suggests is the correct and proper way for it to be working. This means completely removing, to the greatest degree practical and possible, all high-starch and low-cellulose products of modern agriculture. No bread, cookies, crackers, chips, cake, pretzels, sugary drinks, potatoes of any kind, and so on. How could it NOT be natural? What's artificial is agriculture. It is agriculture that was just invented a moment ago in the evolutionary scale of man's development. It is agriculture that has artificially CREATED all of these highly caloric, high-starch and low-cellulose man-made foods. there were no cookies, crackers or chips. While many people call this “Paleo” I strongly prefer the term “very low carbohydrate” since a great deal of confusion exists over how much meat our paleolithic ancestors were able to hunt, catch and consume. Many people who go “low-carb” replace the calories lost from carbohydrate with protein from meat. And while it is easiest to obtain the mix of essential amino acids and minerals our bodies require for full health from animal meats of various kinds, over eating protein results in the production of glucose from the excess protein (through a process known as gluconeogenesis). Researchers have found that eating a modest amount of protein, just enough to satisfy our body's needs, is optimal. Then, after a diet rich in salad and low-sugar vegetables and fruit (all technically carbohydrates, but low-starch and high-cellulose), make up the balance of total calories by enjoying healthy fats such as those in olive oil based dressings, nuts and oil rich vegetables such as avocado. You are invited to peruse the other low-carb and health-related pages here. The two-part podcast I produced with Leo Laporte is available in audio and video formats, as well as text transcripts in several formats. And be sure to examine the several excellent books I have read, enjoyed immensely, and reviewed.